Planet Vespa - Vintage Vespa Scooter Sales : Company Info. security & delivery of your scooter. Testimony to our success in both service and quality is the 100% positive feedback from eBay generated sales. 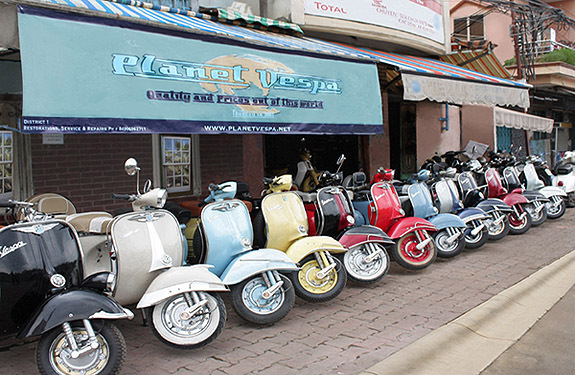 At Planet Vespa you can either custom build your Vespa from our accessories page, or select from our most recently completed inventory,(see catalog). Our quality is adapted to suit every individual's needs, providing purchasers with a large range of colours & styles for both paint work & and upholstery. 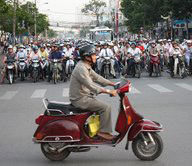 Vietnam is populated with the highest number of motorbikes and scooters per capita in the world presently totaling more than 16.5 million. Its no surprise that vintage Vespas can be found amongst this huge and diverse range of two wheeled vehicles. Vietnam’s well known second name is: The Land of Motorcycles. From 1958-1971 the Vietnamese government set up a free trade direct shipping channel from Europe, during this time a great deal of Vespas were shipped in directly from Italy, predominantly by French business men realizing the massive market potential they could tap into. Vietnam’s ancient land is also known for its rich supplies of valuable antiques. Not only Vespas but many other vintage vehicles such as rickshaws, cyclos,mobylettes, Italian three wheeled cars and antique engine powered bicycles. Vietnam is the star country for salvaging and restoring original vintage motorcycles and scooters. 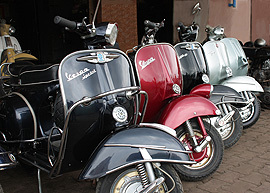 We only seek out and restore Piaggio Italian made Vespas imported into Vietnam from Italy during the 60’s - 70’s. All our Vespas engine and chassis numbers match and are checked off against Piaggio’s original factory lists. The Vespas we restorre are 100% genuine items and that’s why they are a good investment. There are many websites that can be used to authenticate Vespas by entering the matching engine + frame numbers. The search will then reveal the year of manufacture and models details. See link below. 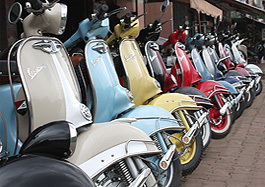 With Planet Vespa you can feel confident in knowing you are purchasing a genuine Italian made scooter that will increase in value. of parts activated from the day you pick up your Vespa form the port. There are some restorers in Vietnam that take tired and worn out Vespas and just give them respray without doing anything to them, then sell them in that state to the unsuspecting. All the components are worn out even before you make the purchase. These are what have given Asian restorations a bad name.